The murder of another Christian in the city of Kirkuk, Northern Iraq, has left the country's faithful shaken. Twenty-nine year old Ashur Yacob Issa was kidnapped late Friday or early Saturday morning (13th or 14th May) and a ransom of approximately $100,000 was demanded of his parents. The young Catholic's body was discovered beheaded and mutilated Monday morning (May 16th), after his poor family was unable to meet the kidnappers demand for money. The Archbishop of Kirkuk, Msgr. Louis Sako denounced the murder and has appealed “to those who were capable of committing such an inhuman act...” that they think of the children they have left orphaned and the woman now a widow. If there is no human justice, sooner or later, there will be divine justice. Violence against Christians in Iraq is high on the agenda, according to reports by the Catholic Church. Since, 2003 approximately 2,000 Christians have been killed, with dozens of attacks carried out. Six priests have been murdered, along with the death of one archbishop. 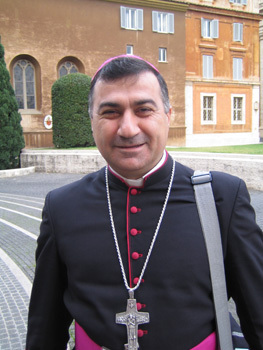 Chaldean Catholic Archbishop Bashar Warda of Erbil also spoke out saying that the murder was meant to be an intimidation tactic toward Christians so that in the future they will be more apt to pay ransoms on demand. Archbishop Warda suspected Islamists fundamentalists behind the recent act of violence and called on Muslim clerics to make clear to their faithful, that such murders are crimes against Humanity, and against Faith. 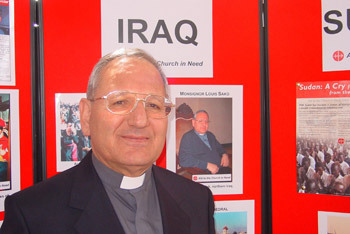 A delegation from ACN is currently in Iraq evaluating the situation of the Church. Speaking with Iraqi Christians, they have found that most Iraqi Christians question the benefit of interreligious dialogue with Muslims. One priest added his opinion saying he did not know what they were to make of it as “the Muslims speak to us constantly about a “peaceful coexistence”, but then when something happens, violence does not seem to be condemned by Muslim clerics.” Another priest added that they will come when invited to preach, but will not listen in return. Northern Iraqi Christians living in a community settlement close to the terrorist's stronghold in Mosul, protect themselves from the terrorists (and criminals) with concrete walls, checkpoints and armed guards. “Armed gangs are a major problem in Mosul and its surrounding area,” said the settlement's mayor. “We suspect that there are political parties in Iraq who pay these criminals who are hunting down Christians.” The mayor echoed words by Archbishop Warda saying that in some Iraqi Mosques, intolerance against Christians is still being preached. Directly under the Holy See, Aid to the Church in Need (ACN) supports the faithful wherever they are persecuted, oppressed or in pastoral need. ACN is a Catholic charity helping to bring Christ to the world through prayer, information and action. Founded in 1947 by Fr Werenfried van Straaten, whom Pope John Paul II named “An outstanding Apostle of Charity”, the organisation is now at work in about 130 countries throughout the world. The charity undertakes thousands of projects every year including providing transport for clergy and lay Church workers, construction of church buildings, funding for priests and nuns and help to train seminarians. Since the initiative's launch in 1979, Aid to the Church in Need's Child's Bible - God Speaks to his Children has been translated into 162 languages and 48 million copies have been distributed all over the world. While ACN gives full permission for the media to freely make use of the charity's press releases, please acknowledge ACN as the source of stories when using the material. For more information or to make a donation to help the work of Aid to the Church in Need, please contact the Australian office of ACN on (02) 9679-1929. e-mail: info ( a t ) aidtochurch.org or write to Aid to the Church in Need PO Box 6245 Blacktown DC NSW 2148.